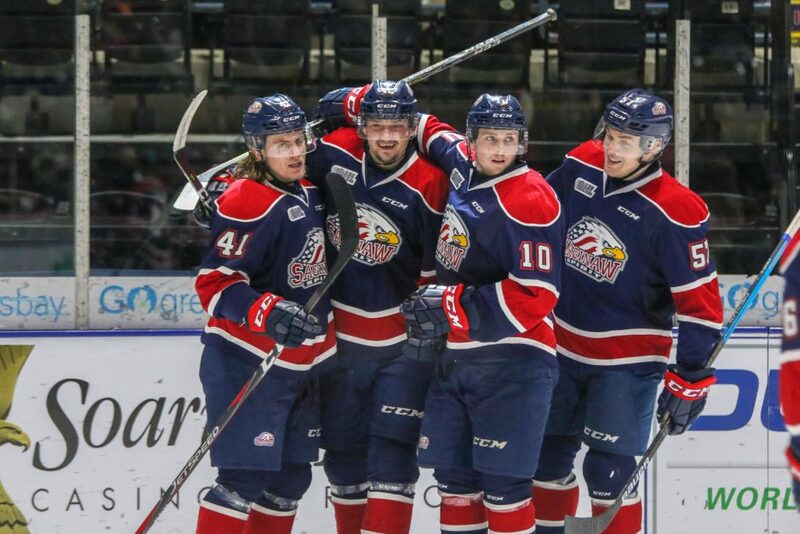 Saginaw, MI – The Saginaw Spirit return to The Dow Event Center tonight to begin a four-game home stand against the London Knights. 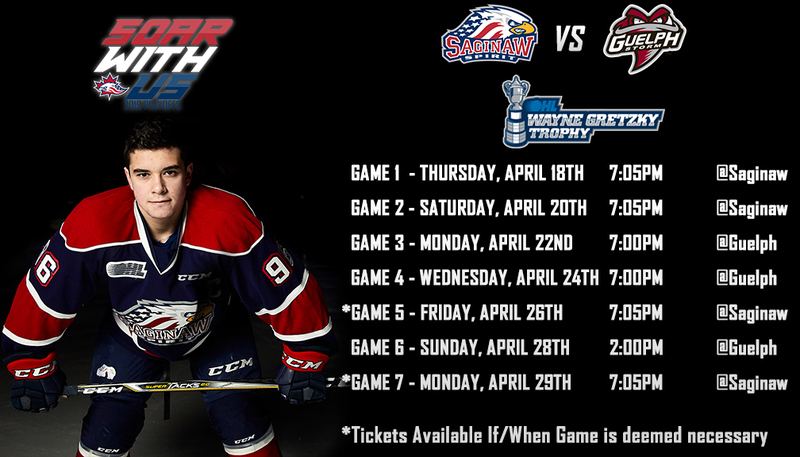 Saturday marks the second of a four-game regular-season series between the Spirit and first-place OHL Western Conference Knights as well as the first meeting in Saginaw. Opening faceoff is scheduled for 7:05 p.m. (EST). The Spirit have won their last three games after falling in back-to-back contests on the road last week. 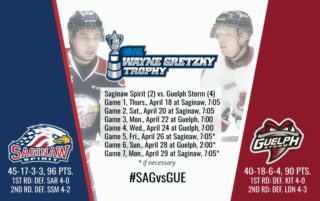 In the West Division, Saginaw trails the Sault Ste. Marie Greyhounds for first place by two points, having already surpassed its season points total from 2017-18 back on February 1. London ended the Spirit’s seven-game winning streak in a 4-1 final at the Budweiser Gardens on January 11. Listen live on OHLLive.com, the flagship WSGW 100.5 FM Talk & Sports and fmtalk1005.com with Joey Battaino and Dennis Desrosiers. 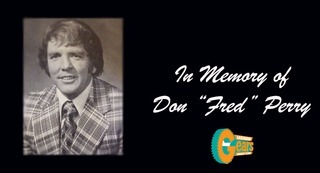 “Countdown to Faceoff” with host Domenic Papa starts at 6:50 p.m. (EST). McLaren Bay Region and the Spirit will present the fifth annual “Talk Today – Hope for Tomorrow” event tonight in an effort to bring awareness to mental health issues and help put an end to the stigma that surrounds them. Professionals from area mental health agencies will be on hand to discuss referral sources that can provide immediate assistance. 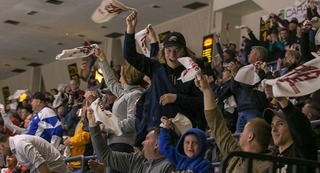 To purchase your tickets for all Saginaw home games, call (989) 497-7747, visit saginawspirit.com, or by visiting the Saginaw Spirit Store at 5789 State Street, Saginaw, MI. The Spirit scored four goals at the WFCU Centre Thursday en route to their fourth win over the Windsor Spitfires in the previous five meetings this year. It’s the first time Saginaw has extended beyond the 70-points mark in a season in over five years. 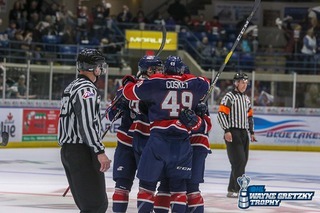 Cole Coskey, Brady Gilmour and Damien Giroux collected a goal in what was the team’s sixth game away from home in a 14-day period. Goaltender Ivan Prosvetov made 31 saves and earned his 26th win since being taken in the first round (13th overall) of the 2018 OHL Import Draft. Saginaw is second only behind the Knights for the lowest goals against total among the 10 Western Conference clubs. Coskey’s two goals on Thursday earned him five total in the last five games played this season against the Spitfires. As the first player on the Spirit roster to surpass the 30-goal mark, the fourth-year winger leads the team in points at 61, finishing with at least one point in nine of the last 11 games. Gilmour’s second period goal Thursday would be the first time the Detroit Red Wings prospect would score since January 2. Having reached the 50 career-goal milestone on that date, Gilmour is one away from hitting double digits this year. Giroux has set a single-season best of 20 goals after the win over Windsor. Drafted by the Minnesota Wild in the fifth round (155th overall) in 2018, the captain is nine points away from matching his career best of 43 last season, recording an exact home and away split of 10 goals and seven assists. Prosvetov, one of the more touted prospects for the Arizona Coyotes from the 2018 NHL Draft, has allowed just three goals in his last two starts. With a goals against average (GAA) of 3.04 and a 0.904 save percentage (SAV%), the Moscow, Russia, native is tied for third among OHL goaltenders in wins at 26. Second-year forward Camaryn Baber was named the Nexteer Automotive “Player of the Week” after recording two goals and two assists in back-to-back wins last weekend over the Flint Firebirds. Receiving first-star honors on February 1, Baber’s four-point outing brought him to five goals and six assists for 11 points on the season. Cole Perfetti is on a five-game points streak after finishing with a season-high three assists against Windsor. The 2018 OHL Priority Selection first-round (5th overall) pick is seated in the top-five in the league among first-year players in goals (22), assists (25) and points (47). 2018 New York Islanders second-round (41st overall) draft pick Bode Wilde recorded his third three-assist outing of the season on Thursday. Ranked first on the team in assists at 41, the Plymouth, Michigan, native is second in the league behind only Ryan Merkley of the Peterborough Petes. Overage forward Albert Michnac earned first-star honors on February 2 on a goal and assist against the Firebirds. The former 2016 Import Draft second rounder has grabbed seven points dating back to January 25 and is fourth on the team in assists at 30. On special teams, the Spirit have the league’s sixth-best power play unit on 44 goals for a 24.6 percent success rate this season. The penalty kill is ranked fourth overall with 33 goals allowed for an 81.2 percent success rate. The Knights, who were announced as the third-ranked club in this week’s Kia CHL Top-10 Rankings for this season, put their nine-game points streak on the line in back-to-back road contests this weekend against the Spirit and Greyhounds. It’ll be a pivotal test for a team who hasn’t lost in regulation since January 17 and has won its last seven games. At 37 wins, seven losses, five overtime losses and one shootout loss, London is one-of-two teams in the OHL to yield a single-digit regulation loss total through the early half of February. The Knights are the first Western Conference club to clinch a playoff spot. Overage forward Kevin Hancock is ranked in the top five across the entire OHL in points (82), goals (39) and insurance goals (8). Hancock was traded from the Owen Sound Attack before this year’s trade deadline, having scored eight goals and 12 assists for 20 points in 15 games played with London. 2018 Columbus Blue Jackets first-round (18th overall) draft pick Liam Foudy leads the Knights with a plus-minus rating of +35. The 19-year-old forward is third on the team in goals (28) and fifth in assists (25). With a goals against average (GAA) of 2.69 and a 0.913 save percentage (SAV%), overage goaltender Joseph Raaymakers is fourth in the league in both categories. The former second-round selection (37th overall) by Sault Ste. Marie in 2014 is tied with Prosvetov in wins. On special teams, London is ranked first in the OHL on the penalty kill this season with 25 goals allowed for a 88.3 percent success rate. The Knights also have the 11th best man-up unit with 38 goals scored for a 20.9 percent success rate. There will be a combined 17 players on the ice Saturday with their rights owned by NHL teams. For the Knights, it’ll be Foudy (Columbus), Jordan Kooy (Vancouver), Paul Cotter (Vegas), Alex Formenton (Ottawa), Evan Bouchard (Edmonton), Adam Boqvist (Chicago), Joey Keane (NY Rangers), Jacob Golden (Minnesota) and Alec Regula (Detroit). 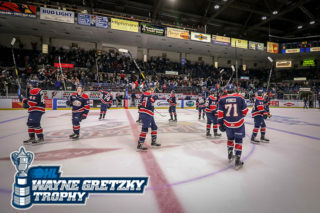 Defenseman Reilly Webb (Detroit), forwards Ryan McLeod (Edmonton) and Owen Tippett (Florida) and Blade Jenkins (NY Islanders), Giroux (Minnesota), Gilmour (Detroit), Prosvetov (Arizona) and Wilde (NY Islanders) will represent Saginaw. The Spirit conclude an eight-game regular-season series with Flint at The Dow next Wednesday. Both silent and live auctions and the Music of Empty Canvas will be featured in the Arts, Hearts and Spirit Fundraiser for the Saginaw Art Museum. Come see a hockey painting created right before your eyes by renowned artist Mike McMath. Discounted tickets are available for $13 with a portion of the sales benefiting the Art Museum.